I pondered for a while over what I was going to write my blog on and many things crossed my mind. Topics included the great spiritual journey I have had in Kenya, how I found myself in machine shopping centre while facilitating groups with sheep baaing in the background or in general talking about how BK has indeed, and truthfully, changed my outlook on how to start a business. However while all these things would be wonderful, meaningful and inspiring to the masses I decided that, as the main readership of this will be future fellows, and that all of you will have your own ‘finding yourself’ experiences and probably do not want to read about another, that there was no better topic then a few words of advice on the dos and do nots of living in Nakuru. What is this?!? You are about to find out…. Try and find out when Mokimo night is and run away from the Seasons hotel as quickly as possible (I suggest to Java where the source of Western food is plenty). For those of you who do not know what Mokimo is (trust me, it is better to have never experienced it) it can only be described a green potato mash with white maize in it. It is as bizarre in person as it sounds on paper and its existence I have figured to be due to an alien invasion that has mutated British cuisine and then tele-ported it to Africa. The experience of Mokimo is only made worse by the fact that it is the main meal. I love potato as much as the next person but, as one would never have mash potato as a meal in England, I am not sure why it has been deemed as socially acceptable at the hotel. Not even a vat of chilli sauce can save the potato from its dull fate (and trust me I am a big fan of chill sauce). I hope that none of you have to experience it after climbing Mount Kenya like this cohort did, after climbing a mountain, Mokimo is really the last thing you want to appear on your plate. Try and avoid Patrick. Patrick is harmless bar from his slightly annoying tendency to try and sell you things and exchange foreign currency with you (particularly if your not from that country). From Danish Krones to Australian Dollars Patrick seems to get every currency but Kenyan Shillings. If you are lucky he give you a gift but for the 6 weeks of working in Nakuru it is really better just to avoid him rather then have him hassle you. Take some time off and visit the infamous Rafikis (though I would highly suggest not on a school night). Rafikis is muzungu central for Nakuru, full of foreigners (well, maybe not full but full in Nakuru terms anyway) wanting to let their hair down after a long week. While my dancing is not one to be desired I believe that Rafikis has appreciated my attempts to wind my bumsie in a semi Africanish like way. I hope these dos and don’ts has given you a better idea of ‘what to expect’ in Kenya, maybe not in the most traditional of terms, and that you take them on board. The rest I will let you figure out! I have to disagree with your outlook on mokimo, it’s a delicacy if you ask me. I would like to change your view on this Kenya traditional food. Let me know when you are next in Nakuru and I will treat to the best mokimo meal ever. 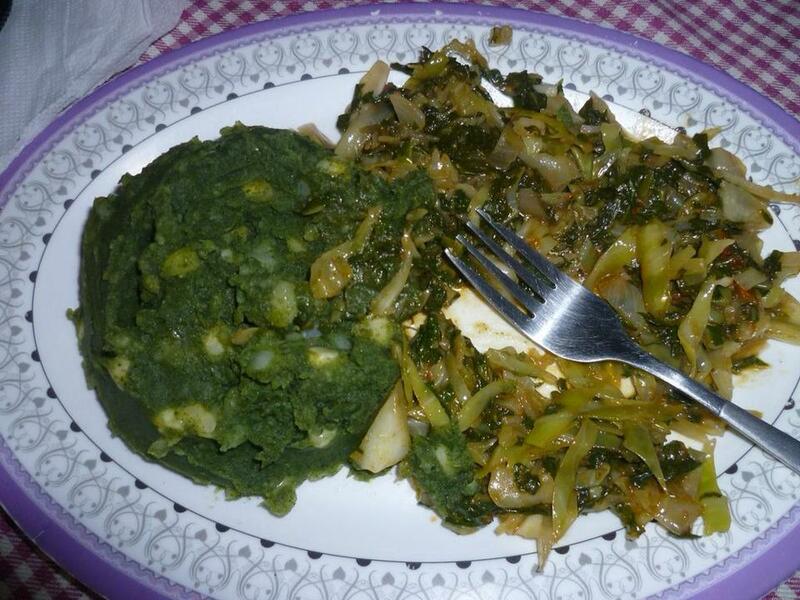 It is one of Kenya’s traditional foods and is very delicious if made by an expert….like me! It is a mixture of English potatoes ( I prefer the reddish variety with a buttery taste), fresh baby pumpkin leaves and green maize. It is commonly served with fried beef or chicken or some other protein and vegetables(optional). It is truly delicious and very nutritious if you want a break from the empty junk food.